Intense Polish Therapy: Rimmel London: Stay Glossy Lip Gloss | Review Time! Rimmel London: Stay Glossy Lip Gloss | Review Time! Hey Everyone! I'm here this week to give you my thoughts on the Rimmel London: Stay Glossy Lip Gloss. I think this lip gloss might have been the first gloss I ever purchased, so I've had it in my collection for a long time and have used it many times! Popcorn For 2, and Non-stop Glamour. These glosses feel very light on the lips and are quite sheer, making them great on their own or over top of a liquid lipstick. They can be slightly sticky if you apply too thick of a layer, so you will want to be careful of that when applying. This lip gloss glided on my lips quite easily when applied and didn't become patchy. It didn't make my lips sticky and gave them a beautiful glossy finish. 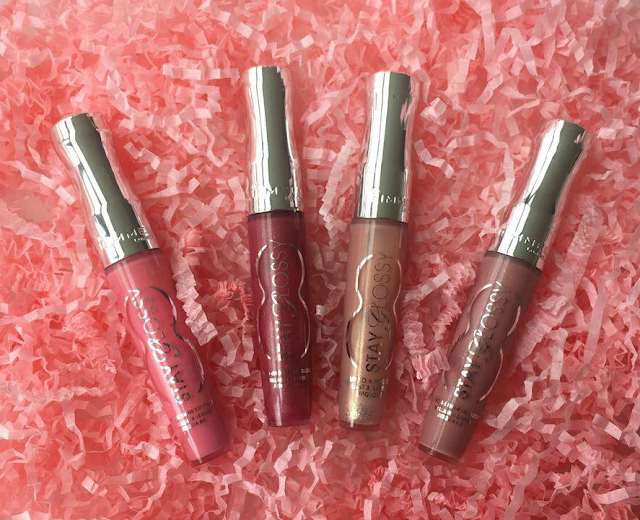 There is a slight floral scent to these lip glosses, but nothing very overwhelming. 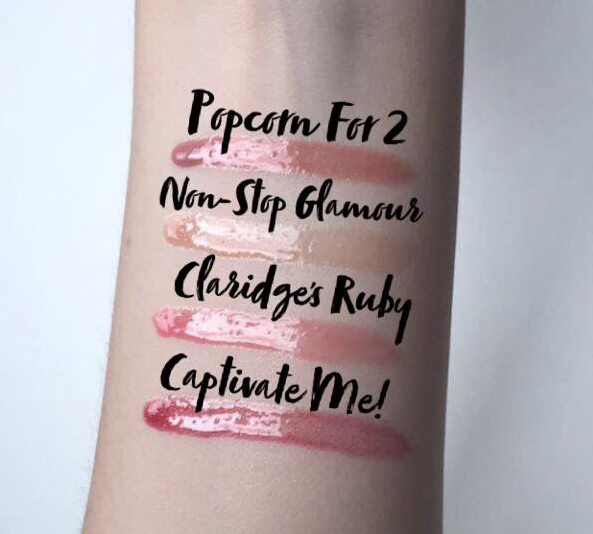 They are quite sheer, so it's hard to tell the difference between some of the lighter shades in pictures or from far away (you can see this from the lip swatches of Non-Stop Glamour and Popcorn For 2). I wore the shade Claridge's Ruby for about five hours, and you can see that the colour has mostly faded away. The glossy finish is still the same from when I applied it, which is very good considering I didn't reapply throughout the day. It also did not slide around on my lips or bunch up in the middle, which usually is the case for most lip glosses because of their consistency. It was slightly sticky, but my lips didn't stick together when I talked or moved my mouth. All in all, the Rimmel London: Stay Glossy Lip Glosses are quite good for a drugstore lip gloss. 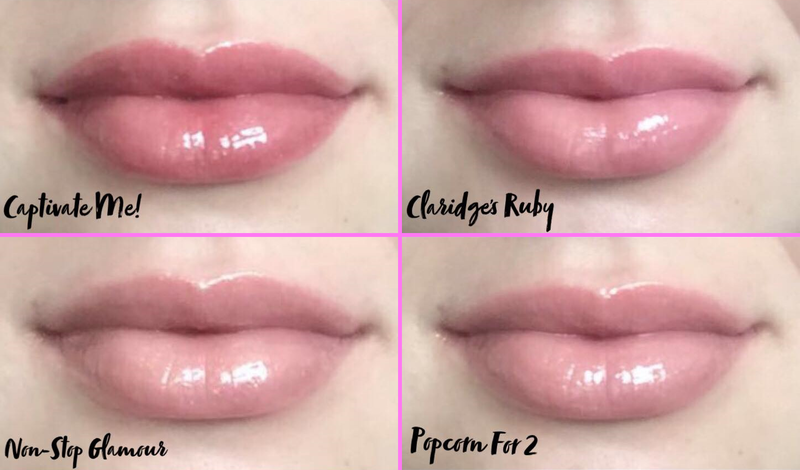 I have used better lip glosses, but I always go back to these ones when I need a good, reliable gloss without breaking the bank. I would put this lip gloss at the top for the drug store, but in comparison to high end lip glosses, it would only be in my top five. I would recommend these to anyone looking for a good gloss for a good price!